The state of Iowa was the star of this political season for over a year. The Hawkeye state launched Barack Obama’s candidacy, derailed Hillary Clinton’s and turned Mike Huckabee into a GOP power-broker. All eyes were on Iowa–and then the political circus left, on to New Hampshire and the 48 caucuses and primaries that followed. Now Iowa needs your attention again. Key parts of eastern Iowa, in case you haven’t heard, are underwater, the result of catastrophic flooding. Nearly half of the state is considered a disaster area. 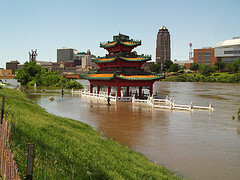 "The economic costs of the devastating floods were also beginning to seep in," the New York Times reported today, "tourism officials, who depend on the short summers, were bracing for washed-out seasons; farmers in many states stared out at ponds that had once been their fields of beans and corn; and officials were preparing to shut down 315 miles of the Mississippi River, a crucial route for millions of tons of coal, grains and steel." Click here for a haunting slideshow compiled by the Times. The floods hit the same week as a tornado in western Iowa tragically killed four Boy Scouts and injured 50 others. 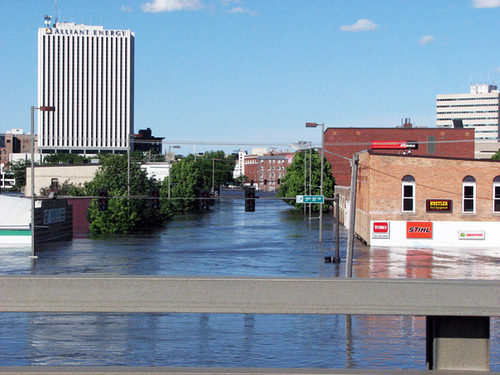 Water levels are receding in some places, like Cedar Rapids, but may soon rise in others, like Iowa City. The latest flooding brings back haunting memories of the Great Flood of 1993, the most costly in US history. My hometown of Fairfield, in southeast Iowa, was one of the few not located on the banks of a river–and thus protected. Most other places weren’t so lucky. I remember flying overhead that summer and seeing virtually the entire state submerged in water. To this day, it’s still one of the saddest sights I’ve ever seen. Iowans remember those day more vividly than any war. Here’s a good article about how you can help. Consider donating to the Red Cross’s disaster relief fund or, if you live in the area, contributing your time. We’ve seen the devastation caused by natural disasters in New Orleans, Myanmar and China recently. Let’s do everything we can to help those in need.